During a side event, Alvaro Umaña, Costa Rica, and Elmer Holt, Climate Technology Initiative, presented the Fiorello H. La Guardia Foundation “One World Award” in recognition of work in clean technology transfer that advances sustainable agriculture. 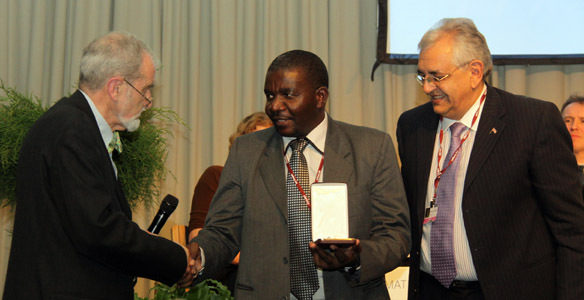 The recipients of the award were Bakir Lozane of Lozane Farms, Maputo, Mozambique, and Jose Roberto Fonseca of Instituto Eco-Engenho, Maceio, Brazil. Rae-Kwon Chung, Republic of Korea; and Rob Lake, APG Asset Management. This session considered how private finance can be mobilized to complement public finance for climate change action and the transition to a low-carbon economy. Nick Robins, HSBC Bank, moderated the panel, noting it would continue a dialogue that the finance sector has been engaged in for years. 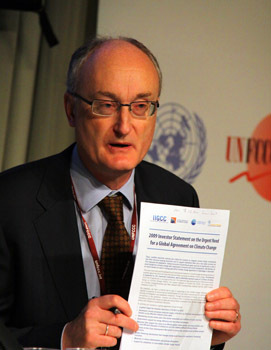 Rob Lake, APG Asset Management, speaking on behalf of IIGCC, presented a document supported by 191 financial institutions from around the world, calling it an “unprecedented” and “powerful mainstream” statement of support for a strong politically-binding international agreement on climate change, followed “soon after” by a legally-binding agreement. 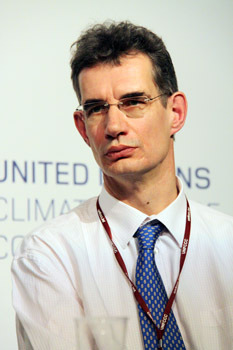 James Cameron, Climate Change Capital, commented that the reallocation of finance from high- to low-carbon activities will depend on investors’ perceptions of both infrastructure and public policy risks, and emphasized the need to properly price climate risks to encourage these investments. Rae-Kwon Chung, Republic of Korea, expressed frustration with “ideological and political” approaches in the negotiations that prevented the consideration of market mechanisms for climate financing. 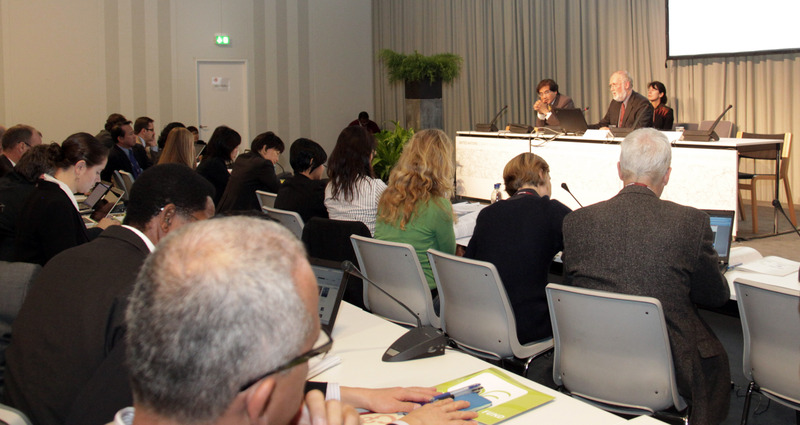 He outlined a Korean proposal for carbon credits associated with Nationally Appropriate Mitigation Actions (NAMAs). Underlining the need to address risk and returns to investment in climate financing, Susan Krohn, Germany, explained that “state-centric systems under international law” make this more challenging. She encouraged using public money to leverage private investment. Fernando Tudela, Mexico, agreed with Chung that the CDM was a starting point, noting that it represented the first time carbon had a price in many developing countries. He encouraged expanding beyond the CDM and building on recent proposals for credits beyond projects. 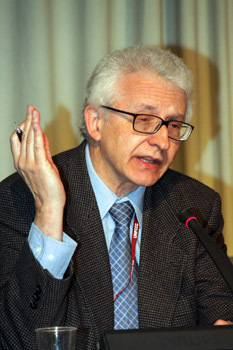 Tudela emphasized that the carbon market is dependent on regulation. During the discussion, panelists noted the urgent need for action on emission reductions, cautioned against placing “unrealistic expectations” on the CDM, and highlighted the need for multiple public and private mechanisms to address climate change. Participants considered other issues, including: private sector finance in Africa; low-carbon growth plans and the reorientation of economic development; financing for city-level activities; investment and regulatory environments; and the role of the private sector in adaptation. Robins, HSBC Bank, concluded with a call for a “transformative” Copenhagen statement. Rob Lake, APG Asset Management, said 191 mainstream financial institutions, representing US$13 trillion of investments, are strongly in favour of national and international action on climate change. 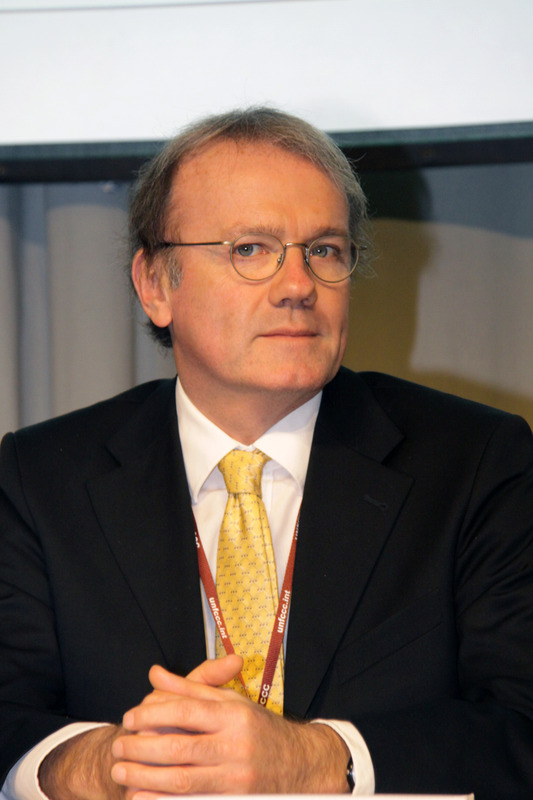 James Cameron, Climate Change Capital, highlighted the currency risks involved in investing in emerging markets, and noted that CERs mitigate these risks by acting as an international currency. L-R: Wangari Maathai, Green Belt Movement; Samuel Naikada, Dupoto Forest and Wildlife Association; Fredrick Njau, Green Belt Movement; and Mia MacDonald, Brighter Green. 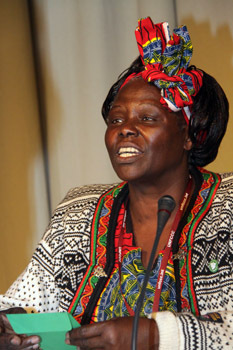 Wangari Maathai, Green Belt Movement and Nobel Peace Prize Laureate, described how the Green Belt Movement has broadened its focus beyond planting trees to include broader issues such as governance and gender, with an increased focus on improving access by communities to carbon finance for reforestation projects. She lamented the technical barriers that prevent communities from implementing projects under the CDM and called on the World Bank and African Development Bank to review their policies that she said favor consultants and disadvantage indigenous peoples and local communities. 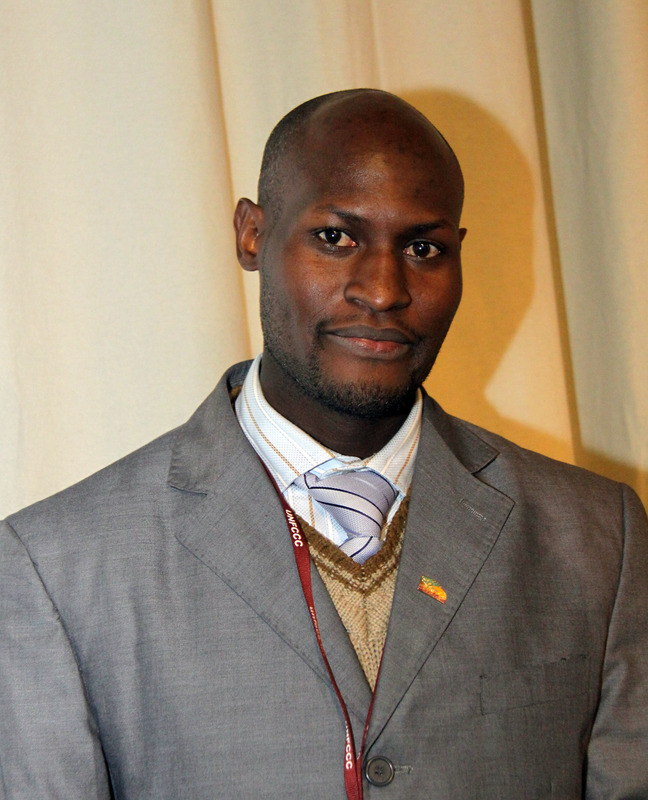 Fredrick Njau, Green Belt Movement, detailed two Kenyan community-based CDM projects that aim to restore degraded areas, improve livelihoods and sequester carbon. To succeed, he said, communities require: financial assistance; marketing promotions; affordable technology; the right to participate; enforceable contracts; and transparency. Mia MacDonald, Brighter Green, cautioned against the increase in global meat consumption that is contributing to climate change. She noted that the contribution to climate change by industrial farmers impacts small-scale agriculture and livestock keepers, and that issues of equity and “climate space” require further attention at the policy level. Samwel Naikada, Dupoto Forest and Wildlife Association, detailed a forest management project that aims to promote the sustainable use of the forest in ways that benefit the community and conserve biodiversity. Participants discussed, among other things: community land tenure and the sharing of local benefits; the barriers communities face in accessing funds from the World Bank and the African Development Bank; rights for nature; and the benefits of vegetarianism. Fredrick Njau, Green Belt Movement, stated that the technical aspects of establishing a CDM project are complex for communities, and are compounded by other factors, such as high costs, the level of local capacity, and monitoring and verification. L-R: Ian Noble, World Bank; Heikki Toivonen, AHTEG Co-Chair, Finland Environment Institute; Jochen Flasbarth, Germany; Guy Midgley, AHTEG Co-Chair, South African National Biodiversity Institute; Robert Watson, AHTEG Co-Chair, UK; Katia Karousakis, OECD; and Barney Dickson, UNEP-WCMC. Kazu Takemoto, Japan, stressed his country’s commitment to working on issues related to the interlinkages between climate change and biodiversity. Guy Midgley, AHTEG Co-Chair, South African National Biodiversity Institute, summarized the results of the report, highlighting: new insights into how biodiversity can help people adapt and mitigate; how mitigation and adaptation activities can have both positive and negative impacts on biodiversity; and that ecosystem-based adaptation has the potential to contribute to the objectives of the UNFCCC, UNCCD and CBD. Heikki Toivonen, AHTEG Co-Chair, Finland Environment Institute, stressed the importance of protected areas in storing carbon. Barney Dickson, UNEP-WCMC, noted that despite potential co-benefits, some risks to biodiversity increase as we move from REDD to REDD+ with the inclusion of forest carbon stock enhancement, and the need to build country capacity to implement REDD. 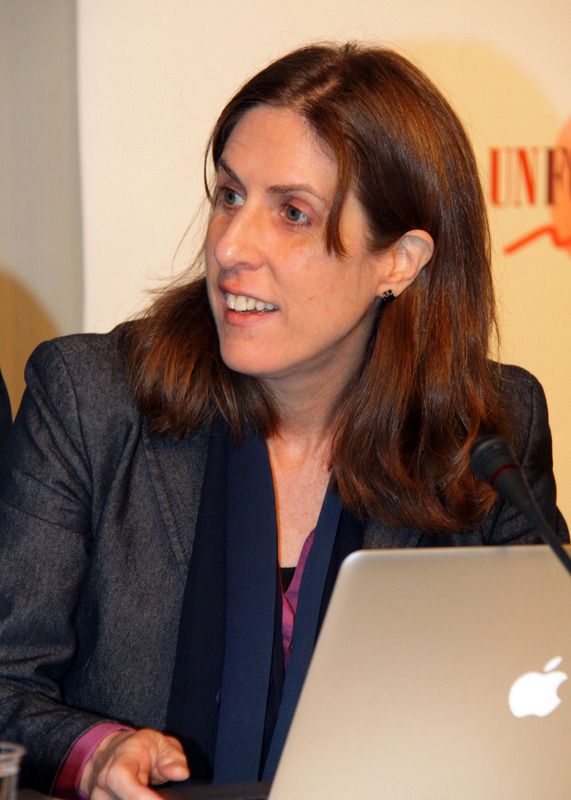 Katia Karousakis, Organisation for Economic Co-operation and Development (OECD), noted the need to focus on economically evaluating and geographically mapping biodiversity and ecosystem services benefits. 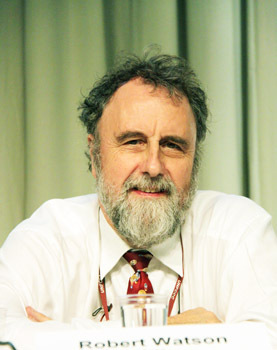 Robert Watson, AHTEG Co-Chair, UK, underscored that climate change is an increasingly important driver of biodiversity loss. He emphasized that biodiversity can be incredibly useful for mitigation and ecosystem-based adaptation, but the mechanisms must be properly designed. Participants discussed a variety of issues related to the Report, including links with agriculture and next steps for the Report. Robert Watson, UK, stressed the need to bring biodiversity and climate change issues together to create a win-win situation. 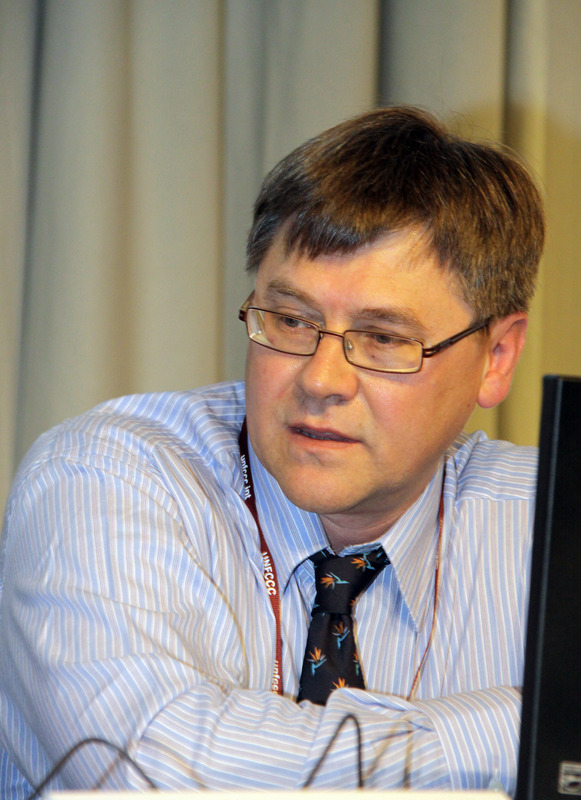 Guy Midgley, AHTEG Co-Chair, South African National Biodiversity Institute, said ecosystem-based management should include enhancement of benefit sharing. Barney Dickson, UNEP-WCMC, stressed that ecosystem-based adaptation should move beyond protecting fragile ecosystems, and should contribute to overall societal adaptation. 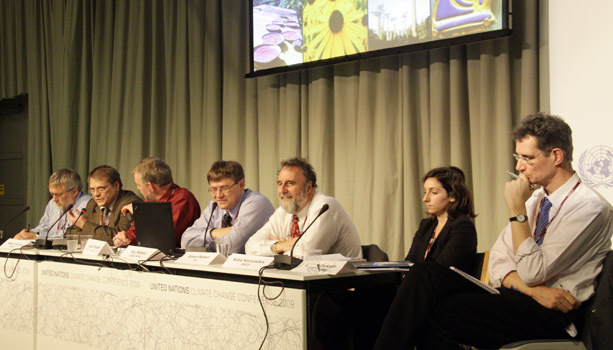 L-R: Jiang Kejun, Energy Research Institute, China; Nebojsa Nakicenovic, IIASA; Markus Amann, IIASA; Leena Srivastava, TERI; and Johan Rockström, Stockholm Environment Institute. Panelists in this event presented scenarios for stabilizing global temperatures at 2°C above pre-industrial levels. Nebojsa Nakicenovic, IIASA, presented IIASA scenarios that demonstrate, among other things, that investment in research and development must increase fourfold and in energy twofold by 2020 to achieve the 2°C goal. 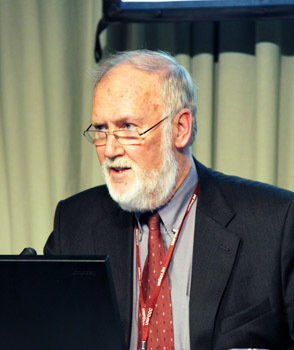 He stressed the importance of immediate, upfront investment to avert a situation where countries would have to achieve negative emissions by mid-century. Markus Amann, IIASA, introduced a scientific tool called Greenhouse Gas and Air Pollution Interactions and Synergies (GAIN), which estimates national GHG mitigation potentials and costs and examines co-benefits for GHG emission and air pollution mitigation. He said the tool seeks out solutions that do not compromise economic development. Amann said GAIN results demonstrate the potential of co-benefits, but that these can be realized only with more ambitious emission reduction pledges. Leena Srivastava, TERI, presented an accounting principle that corrects for the historical encroachment of individual entitlements. She said a carbon budget approach, rather than a per capita approach, provides greater flexibility to define pathways and identify peaking periods. 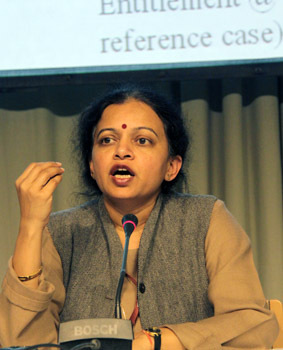 She noted that to achieve targets under a carbon budget approach, India would have to, among other things, increase use of renewables and nuclear power, and would require investment in solar power and the transport sector. 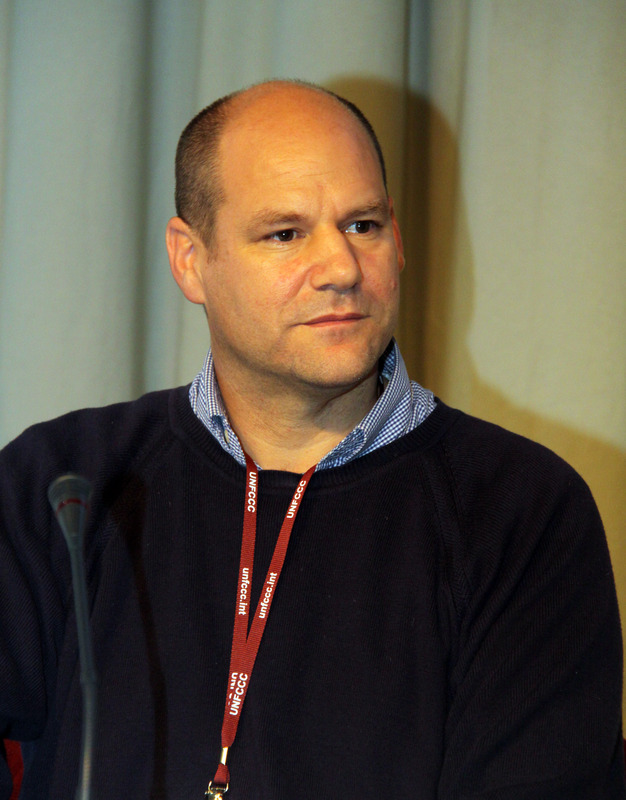 Johan Rockström, Stockholm Environment Institute, stressed that a climate deal may be insufficient to cap global temperature increases at 2°C due to the interlinkages with the global system as a whole. Calling for a socioecological resilience approach, he said there can be no fair deal without Annex I countries committing to binding reductions of 100% by 2050, which could be achieved through domestic and international investments. Jiang Kejun, Energy Research Institute, China, expressed optimism that countries can achieve the 2°C goal with available technologies if appropriate investments and policy measures are applied. Markus Amann, IIASA, said co-benefits, including health benefits, can be achieved in both developed and developing countries. 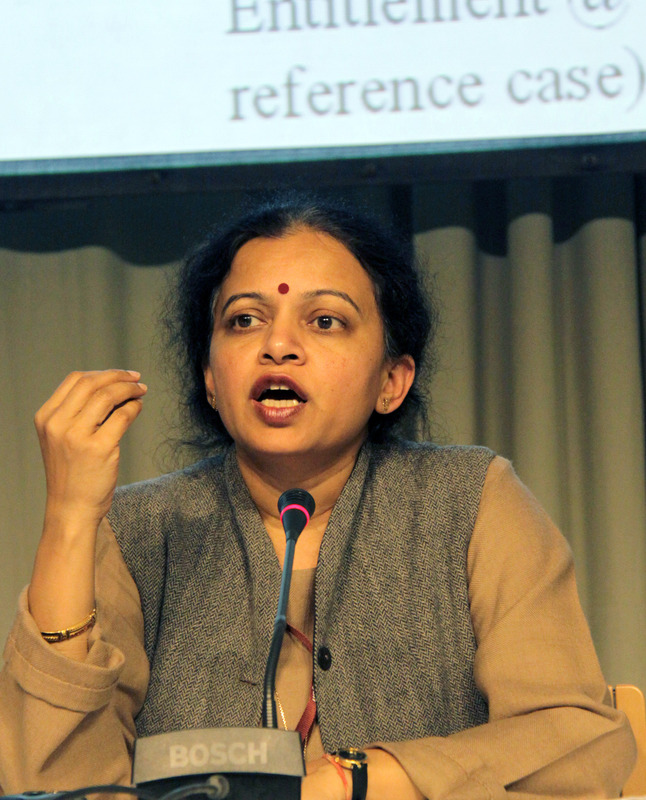 Leena Srivastava, TERI, stated that, in India, short-term investment costs are lower than medium- and long-term ones because there are opportunities to invest in “low-hanging fruit” that lead to immediate emission reductions. 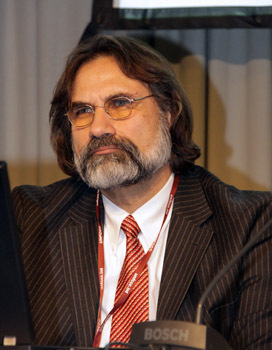 Nebojsa Nakicenovic, IIASA, stated that IIASA’s work is increasingly looking at the interlinkages between climate change and energy, food and water, and poverty and equity. L-R: Participants discussed, inter alia, the role of the World Bank in managing the AFB's Trust Fund and monetizing CERs. This session provided an overview of the Adaptation Fund (AF), outlining its institutional development and processes for funding applications, followed by a question and answer session. 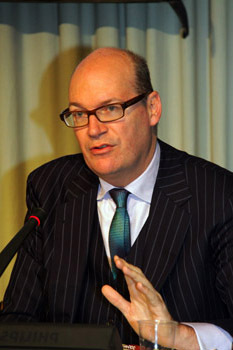 Jan Cedergren, Adaptation Fund Board (AFB), called the AF an “innovative financial mechanism,” highlighting that it: is a new funding source based on an international levy; has equitable and balanced representation of developing countries on its governing body; and provides eligible countries with channels of direct access to resources. Farruqh Iqbal Khan, AFB, outlined the AFB project cycle, drawing attention to two paths by which countries can submit project funding applications: directly to the Board by an accredited National Implementing Entity, or indirectly through a Multilateral Implementing Entity. He underscored the importance of establishing a legal personality for the AFB in allowing countries direct access to financing. In discussions, Cedergren and Khan: elaborated countries’ roles in applying for funding; clarified that the AFB is distinct from the GEF, although the GEF acts as the AF Secretariat; and pointed to the Handbook on Accessing Resources from the Adaptation Fund for more information. Participants and panelists discussed the interaction between the AF and other funding mechanisms that exist for climate change activities, including the future of the AF in the new financial architecture for adaptation currently under negotiation. They also considered: measures to prevent the misuse of funds; review and evaluation processes for the AF and projects; equitable allocation of projects across countries; civil society participation; and gender considerations in adaptation projects. 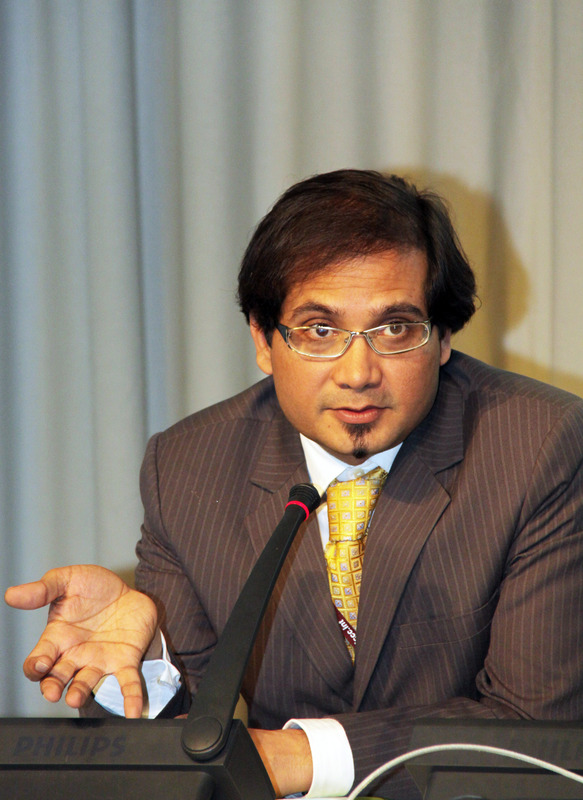 Farruqh Iqbal Khan, AFB, noted that the AFB expects to solicit proposals for funding by March 2010, once its institutional arrangements are complete. Jan Cedergren, AFB, emphasized the transparency of the AFB, noting that it publishes all documents on its website and webcasts its meetings. L-R: Leonardo Caicedo Portura, Organización de los Pueblos Indigenas de la Amazonia Colombiana; Tito Puanchir, Confederación de Nacionalidades Indigenas de la Amazonia Ecuatoriana; and Melva Hurtado, Confederación de Pueblos Indigenas de Bolivia. 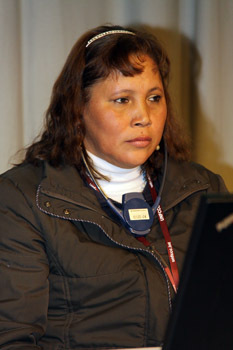 The event consisted of a number of presentations, including by representatives of the government of Colombia, The Woods Hole Research Center and members of COICA on the process and outcomes of workshops held in Ecuador, Colombia and Bolivia to explore the views of indigenous peoples of the Amazon on REDD. Regarding the workshops, many participants agreed that they had been useful for better understanding REDD, through information exchange, and the respective positions of indigenous peoples and governments. Panelists stated that the workshops provided an opportunity for communities to articulate the links between forests and, among other things, their culture, spirituality and customary laws. On the rights of indigenous peoples, many speakers recalled the UN Declaration on the Rights of Indigenous Peoples, underscoring the principles of self-determination and free, prior and informed consent. It was argued that any discussion of REDD must be contingent on progress on securing land rights in the Amazon region. Panelists argued that REDD must not be used to further deny their rights, and must not represent a sale of their forests. One panelist noted that the same central banks that have gained from logging will now also receive income from REDD, with indigenous peoples losing on both counts. Some panelists stated that if REDD is to go ahead, it must be undertaken with indigenous peoples’ input in the development of the projects and with community-based monitoring and reporting. Participants discussed, among other things: financing for REDD; the links between land rights and REDD; the struggle of indigenous peoples in Peru; and the principle of self-determination. 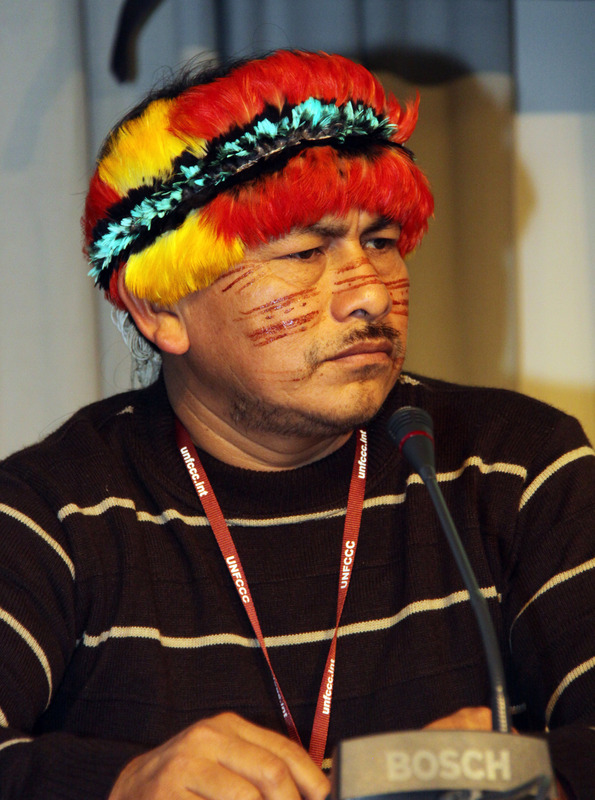 Tito Puanchir, Confederación de Nacionalidades Indigenas de la Amazonia Ecuatoriana, called on his government to enact the Declaration on the Rights of Indigenous Peoples. Melva Hurtado, Confederación de Pueblos Indigenas de Bolivia, stated that indigenous women will be severely affected by climate change and called for full respect of their rights. 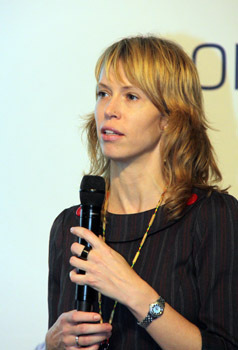 Tracy Johns, The Woods Hole Research Center, presented on a series of workshops undertaken as part of the Forum on Readiness for REDD, which she said had facilitated information exchange between stakeholders. Gloria Carrión, ICTSD, stressed that urgent action needs to be taken to build the resilience of SIDS, LDCs and SVEs to climate change challenges, and that clean, renewable and sustainable sources of energy will be crucial in this process. Edward Allison, WorldFish Center, said the places that will be best for fishing will change as a result of climate change, with a decrease in productive potential in tropical waters and an increase in temperate waters. 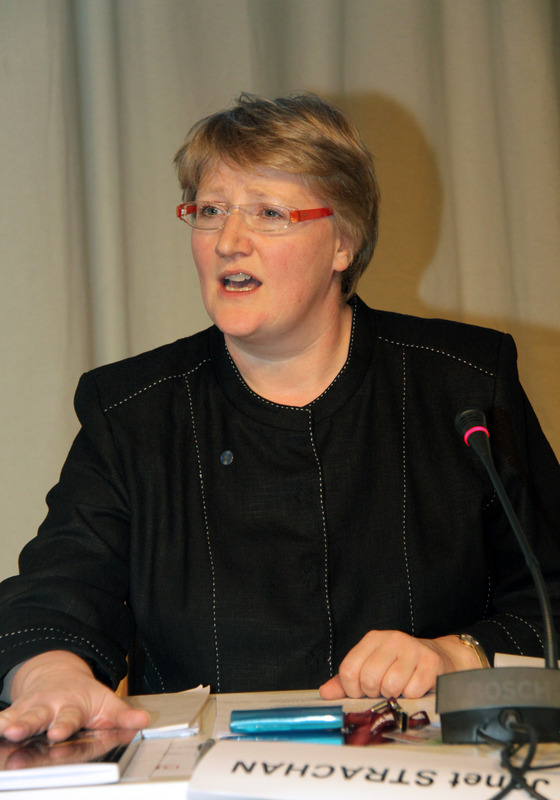 Janet Strachan, Commonwealth Secretariat, said that with respect to climate change, small and other vulnerable states have a unique set of vulnerabilities because their economies are based in climate vulnerable sectors. Janet Strachan, Commonwealth Secretariat, explained that the event would discuss the trade and climate change concerns of small and other highly vulnerable states, and launch a new book entitled “Trade, Climate Change and Sustainable Development.” She highlighted three primary lessons from the study, namely the need to: build climate resilience in small and other vulnerable states; address reputational concerns related to exported goods and tourism; and maintain a supportive international environment by acting collectively. 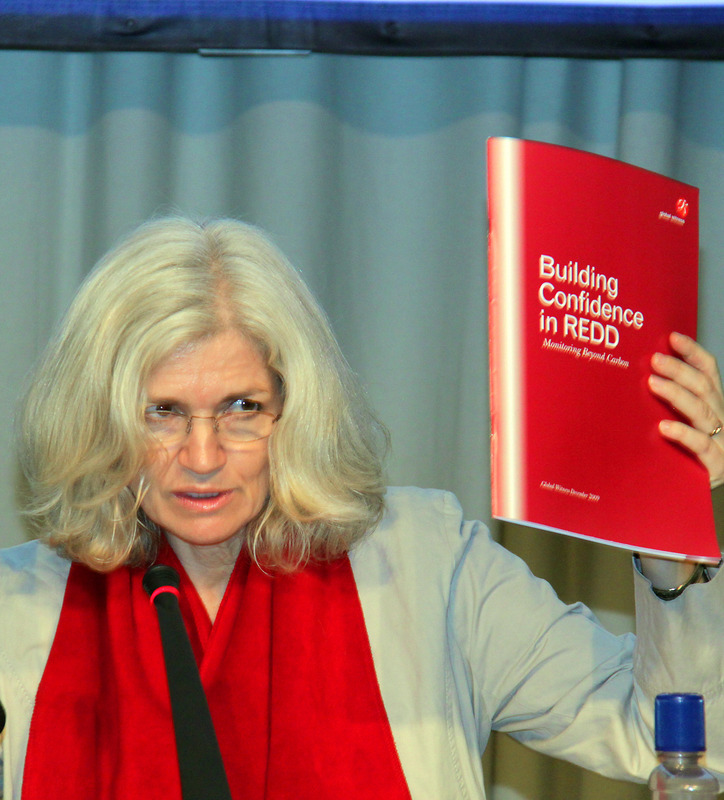 Gloria Carrión, International Centre for Trade and Sustainable Development (ICTSD), provided an overview of the book, noting that it examines the potential role of trade policy in building economic resilience in small, vulnerable economies (SVEs). She noted that the report identifies vulnerable sectors, including agriculture, forestry and fisheries, and summarized findings in four main areas, namely: national ecosystem resilience; environmental goods; fisheries; and intellectual property rights. Edward Allison, WorldFish Center, outlined a report entitled “Climate Change, Fisheries, Trade and Competitiveness: Understanding Impacts and Formulating Responses for Commonwealth Small States.” After highlighting various impacts of climate change on fish trade, he suggested a variety of adaptive responses to deal with these impacts, including sustaining fish stocks and adopting ecosystem approaches to fisheries and aquaculture. 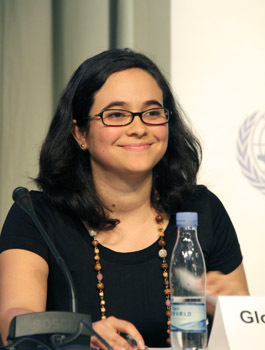 Carrión described strategies to match existing funding mechanisms for development with national policy strategies for climate change. Participants discussed various issues, including those related to livelihood diversification and climate change issues in the World Trade Organization.